Awesome win! This should be in mod portal IMHO. ETA on Google Play Store? Just watched some videos about Big Pharma on Youtube, then remembered I have downloaded this scenario. Did a quick test and quickly addicted to it. Man, you beat the whole game by just some lua files and a blueprint! - Better UI for buying items. Ideally we will have the same layout of the crafting menu, as it is what we are familiar with. - Ability to buy lands, to expand the factory by costing money. - Improve the requester chests: currently, it requires you to have enough money for buying the whole requested item stack or the chest will simply stop buying items. It confused me for a few minutes until I figured out that I have to lower the item count so it can work properly. 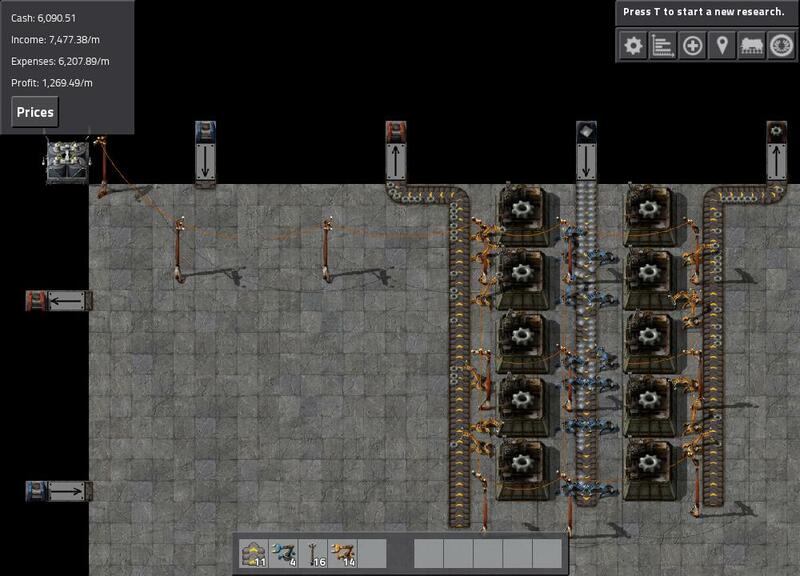 - Fix for the loaders: ability to make a compressed express belt in front of it. 1) Very important: electricity costs you money! 2) Due to point 1, don't connect the electricity network before your factory is ready. 3) Due to point 1, you won't want machines to be idle because they still drain energy. 4) Selling low profit items like iron gear wheels may not be a good idea because you need to pay for the electricity. I haven't done math, but requesting iron plates and selling transport belts seems to be better than selling iron gear wheels for startup. 5) Don't buy too much or you won't have enough money for buying electricity and selling things. 7) The UI for buying items is awkward at this moment, so you won't rely on it. And also due to the previous point, you will need to automate the production of transport belts, which is also why making and selling transport belts is a good idea, then, when technology is ready, inserters and assembling machines. 8) So, you will need to mass production electronic circuit, just like how you do in normal gameplay. 9) However, space is limited. You will need to build things as compacted as possible. Also that's why I have installed Factorissimo. Hopefully it will bring the game to another level, literally. Edit: aw, I can't enter the factory of Factorissimo in god mode. 10) But still, the number of requester chests is limited. Don't block their paths! 11) After you automated the production of electronic circuit, make and sell laboratories! It is the moment you start earning big money. 12) I haven't tried requesting copper wire directly. It may be a good idea due to fewer inserters and assembling machines needed, i.e. lower cost for electricity and less space. LuaEntity API call when LuaEntity was invalid. Oh, this is cool! Unfortunately I won't be able to try it out for a few weeks. @Klonan : if you update this scenario for 0.16, please poke/pm me. For now this scenario is incompatible with 0.16: opening GUI crashs, tiles "out-of-map" causes unable to place player and impossible to make profit). Thanks in advance. This is awesome! Can't wait to play it with some friends tonight. Really fun game mode ! How do you place loaders in your scenario that load into containers? How do you flip loaders in the map editor? Gergely wrote: How do you place loaders in your scenario that load into containers? How do you flip loaders in the map editor? Next time I think we will be banning Kovarex (and probably logi bots) lol. Fumelfo wrote: Really fun game mode ! Interesting, I never really found myself waiting around. Always something to work on. Btw: Energy seems to be free? I had 20MW beacons running and no production or consumption, and the cash didn't change. Also the calculation on the GUI is wrong too. Seems like selling your starter items gives a huge boost, maybe you should start with nothing instead? GeoStyx wrote: Next time I think we will be banning Kovarex (and probably logi bots) lol. No reason to ban Kovarex really -- it takes 240k (in U235 alone) just to get 1 running, which is only a profit of just over 5k/m (not including the cost and effect of speed modules). Besides, making Power armor MK2 makes significantly more money than Kovarex. Grass floor in 0.16.36 stable? Is it normal that at the beginning all the floor is grass and the map isn't working as usual? A few things I think would be nice. -Prices are constant, or do they fluxuate? And if they do, is it shared between players? -Prices from mods. Real values do suggest it is dynamically generated. -Power. How much does X amount of power cost? If you generate your own power, is it sold? Could I run a nuclear reactor? -Item purchase stuff. If you place the last item in your inventory, it buys a new stack, but only if you can afford a whole stack. Why not just buy "As much as you can" or "Just one", if it fails. Or how does this work exactly? Also, sometimes I end up with items in my inventory and have to manually sell them. -Expandable Factory. As long as it is just vertical/horizontal, shouldn't interfere with other players. Either a new area (With unbuildable terrain between), or just expanding the area. -Megamap enabled - Radar doesn't enable it, and I can't look at other people's factories. -Coop - Two+ players in the same area. -Price display search/sort. Given it is sorted by price, I find it somewhat challenging to locate the item for price checking. Alternatively, show the price of the item in your hand, as it is pretty easy to just grab one of those items and check that way. -Cash Flow Data. In addition to Income/Expenditures/Profit, let those expand and show each item type and the prices. -Alternate Input/Output ports - Instead of alternating design, make them flexable. Make the "requester" chests, if nothing is set, act as "Provider Chests". Allow the Loaders to be reversed in direction. -Mutable Input/Output ports - Open up the band of terrain where the chests are, and if you build/remove an input/output chest there, it adds/removes the corresponding loader. Lets you adjust your inputs, though you have to purchase said chests. -Semi-random Challenge. Designated Input/output. Have set input resources at some locations, and set outputs. Objective, naturally, is to produce and output resources, of the preset. -Synergistic price scaling. If you sell bullets, the price drops. If you sell an occasional gun, say 1 per 100 magazines, the price barely drops at all. If you buy these resources, the benefit is lost. Similar for Cars + fuel, Modular armor + Equipment. Trains + traincars + fuel. -Tech. Mode where tech is not fully enabled from the start, and you can't buy anything you haven't researched. Start from basic smelting, and either craft or purchase potions to unlock higher level stuff. -Liquid inputs. If you request a barrel of stuff, or an empty barrel, it replaces the loader with a pipe/Tank, that eats/produces that liquid. May require extra space, not sure. Instead of having to "Buy barrel of water, Empty, sell barrel" it would just be a pipe of liquid. -Ore/oil patches? not sure how this would work admittedly. A lot of this is probably outside of the scope of the project, but at least some of these would be nice.